A delicious accompaniment for any dish. Vary the number of chili peppers in the sauce according to personal taste. ~---------------------------------------------------------- ~-- Heat a large skillet and add the oil. Stir-fry the garlic, crab and eggs together until the egg is cooked. Add the rice, Maggi seasoning, fish sauce and sugar. Continue to stir-fry until the mixture is hot. Add the green onion. Mix together the sauce ingredients. 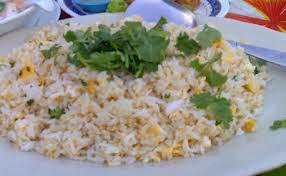 Remove the rice to a serving dish, decorate with the garnish, and serve with the sauce on the side. NOTE: Maggi seasoning is a sauce which is used in many Asian and Southeast Asian dishes, Maggi seasoning is found in Asian food stores. Per Serving (excluding unknown items): 336 Calories; 11g Fat (27.6% calories from fat); 5g Protein; 59g Carbohydrate; 2g Dietary Fiber; 3mg Cholesterol; 8mg Sodium. Exchanges: 2 1/2 Grain(Starch); 1/2 Vegetable; 1/2 Fruit; 2 Fat; 1 Other Carbohydrates.